The key to modeling spiral stairs, I've found, is to think in terms of components. If each stair tread is an instance of the same component (a single stair tread), you can build relatively complex—and flexible—spiral stairs fairly easily. As with most things, it just takes a little bit of planning. 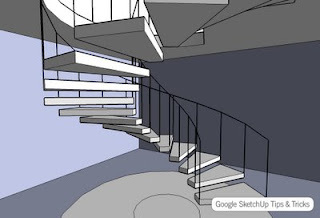 Click on the image below to download a SketchUp model that takes you through my favorite method for constructing spiral stairs (explaining it here would be exhausting for both of us). Nice tutorial !! Bravo !! and world of warcraft WoW gold videos here. Raju and Savitri lived in wow goldTanjore in the state of Tamil Nadu. Raju worked in the rice fields ofwow gold a local landlord or zamindar for six months a year. In turn, he received wow goldfour sacks of rice as salary. He would then sell three of them in the local marketwow gold and keep one sack for himself for food. At the local market he would exchange the rice for wow goldvegetables, flour, and groceries. Savitri would do the cooking and washing and look after the home. Onewow gold year there was a severe drought. There was no wow wotlkrain and the ricewotlk gold fields dried up. By April, the two were wow goldgetting tired of eating nothing but rice. So one day, they decided to go digwow gold for tubers. They took an axe to cut firewood and set off. Throughout thewow gold day Raju cut branches and Savitri searched around for tubers and mushrooms. In the wow goldevening they sat under a tree exhausted. Raju put down his axe nearby and leaned his back tiredly against a tree. Our story today is called "Pigs Is Pigs". It was written by Ellis Parker Butler. Here isworld of warcraft gold Shep O'Neal with the story.Mike Flannery, the agent wow powerlevelingof the Interurban Express Company leaned over runescape moneythe desk in the company's office in Westcote and shook his fist. Mister Morehouse, angry world of warcraft goldand red, stood on the runescape goldother side of the desk, shaking with fury. The argument had been long wow power levelingand hot. At last, Mister Morehouse had become speechless. The cause of the trouble wow polay on the desk between the two men. It was a box with two Guinea pigs inside. "Do asyou like them." shouted Flannery, "Pay for wow orthem and take them. Or don't pay for them and leave them here. Rules aredofus kamasrules, Mister Morehouse. And Mike Flannery is not going to break them." "But you stupid idiot!" shouted Mister Morehouse, madlyworld of warcraft gold shaking a thin book beneath the dofus kamasagent's nose. "Can't you read it here in your own book of transportation rates? Pets, domestic, Franklin toLord of the Rings Online Gold Westcote, if LOTRO Goldcorrectly boxed, twenty-five fly for fun penyacents each." He threw flyffthe book on the desk. "What more do you want? Aren't they Pets, Aren't they domestic? Aren't they correctly boxed? What? "He turned and walked Final Fantasy XI gilback and forth rapidly with a ffxi gilfurious look on his face. "Pets, " he said,"P-E-T-S, twenty-five cents each, twoeq2 plat times twenty-five is fifty. Can you understand eq2 goldthat? I offer you fifty cents." Flannery reached Lord of the Rings Online Goldfor the book. He ran wow powerlevelinghis hand through the pages LOTRO Goldand stopped at page sixty-four. "I don't take fflyff penyafifty cents." he whispered inflyff moneya non-pleasant voice. "Here's theffxi gil rule for it.' WhenLord of the Rings Online gold the agent be anybuy ffxi gil doubt about which two rates eq2 platshould be charged on a shipment, he shall eq2 goldcharge the LOTRO goldlarger. The person receiving the shipment fly for fun penyamay put in a claim for the flyff penyaovercharge. ' In this case, Mister Morehouse, I be Final Fantasy XI gilin doubt. Pets ffxi gilthem animals may be. And domestic they eq2 platmay be. But pigs, I am sure they do be. And my rule says plain as the nose eq2 goldon your face, pigs, Franklin to Westcote, thirty cents each." Mister Morehouse shook his head savagely. "Nonsense," he shouted,"confounded nonsense! I tell you. That rule means common pigs, not Guinea pigs." "Pigs is pigs." Flannery said firmly. Mister Morehouse bit his lip and thenworld of warcraft gold flung his arms out wildly. "Very well," he shouted " You shall hear of this. Your president shall hear of this. It is an outrage. I have offered you fifty cents. You refuse world of warcraft goldit. Keep the pigs until you are ready to take the fifty cents. But, by Gorge, Sir, if one hair of those pigs' heads is harmed, I will have the law on you." He turned and walked wow power levelingout, slamming the door. Flannery carefully lifted the box from the desk and put it in a corner. Mister Morehouse world of warcraft goldquickly wrote a letter to the president of the transportation express company. The president answered, informing Mister Morehouse that all claims for overcharge should be sent to the Claims Department. Mister Morehouse wrote to the Claims Department. Onecheap wow gold week later, he received the answer. The Claims Department said it had discussed the matter with the agent at Westcote. The agent said Mister world of warcraft goldMorehouse had refused to accept the two Guinea pigs shipped to him, therefore the department said Mister Morehouse cheap wow goldhad no claim against the company and should write to its Tariff Department. Mister Morehouse wrote toworld of warcraft gold the Tariff Department. He stated his case clearly. The head of the Tariff Department read Mister Morehouse's buy wow goldletter. "Ah,Guinea pigs," he said,"probably starved to death by this time." He wrote to the agent, asking why the world of warcraft goldshipment was held up. He also wanted to know if the Guinea pigs were still in good health.Before answering, agent wow power levelingFlannery wanted to make sure his report was up-to-date, so he went to the back of the office and looked intoworld of warcraft gold the cage. Good lord, they were now eight wow gold kaufenof them. All well,and eating like hippopotamuses. He went back to the dofus kamasoffice and explained to the head of the Tariff Department what the rules said about pigs. And as for the condition of thekamas dofus Guinea pigs, said Flannery, they were all well, but there were eight of them now,all good eaters.